This procedure describes how to create a Restricted State Utility (RSU) job in Robot Schedule to perform a complete backup of your system. The basic steps you need to follow shown below. Detailed information for those steps are in the following sections. If you need additional information, see the appropriate user guide for Robot Save or Robot Schedule. Create a backup class named WEEKLY. 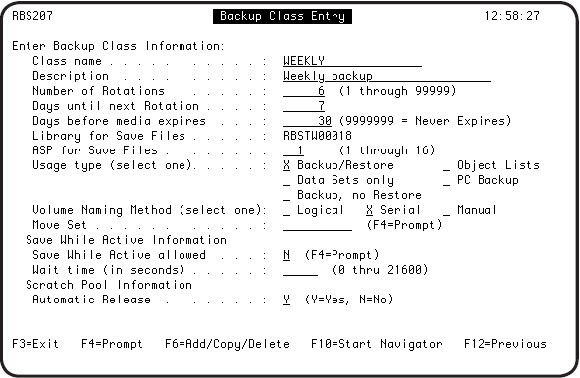 Create a backup set, named WEEKLY, within the backup class. Set the Backup Set type = 9 (Save entire AS/400). Create a command type job named WEEKLYBK. Enter the Robot Save Restricted State Utility command, RBSRSURDY, to prepare the console to enter a restricted state. After you complete the panel entries, pressF10 to start the Robot Save Navigator. This takes you to the Backup Set Definition Maintenance panel. 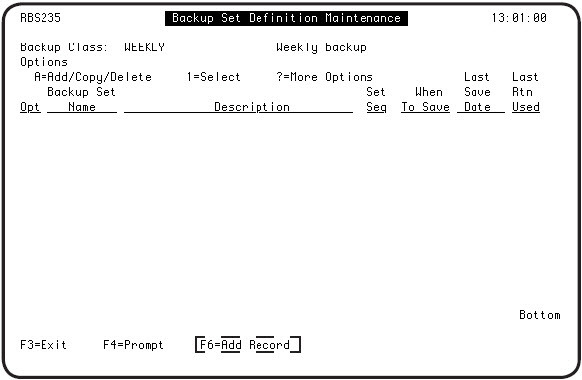 On the Backup Set Definition Maintenance panel, press F6 to create a new backup set. Enter the information for the new backup set on the Backup Set Information panel. 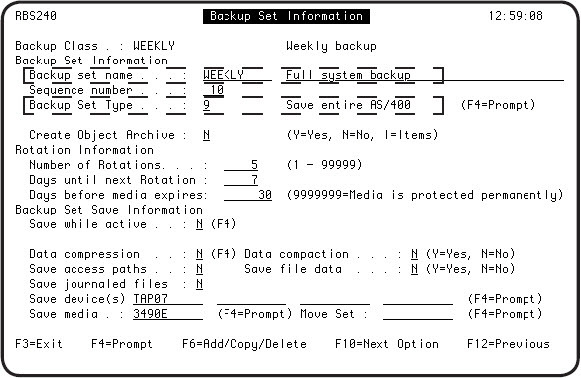 Specify the backup set name, WEEKLY and set the Backup Set Type to 9. You do not need to add libraries to this backup set because Robot Save issues the following commands as specified by Backup Set Type 9: SAVSYS, SAVLIB *NONSYS, SAVLIB RBSPGMLIB to SAVF, Save the SAVF to tape (saves the RBSPGMLIB SAVF to tape), SAVDLO, SAV (to save IFS), SAVLIB RBSDTALIB to SAVF, SAVE the SAVF to tape (saves the RBSDTALIB SAVF to tape). All commands are IBM commands. You can omit libraries from a backup set type 9. Enter a save code of NO next to the library name on the Items to be Saved Within a Backup Set panel. You also can specify whether to create an object archive entry for the objects saved within each library. See the Robot Save User Guide for complete information on creating an object archive. You now are ready to create a Robot Schedule job to run the Robot Save backup set. 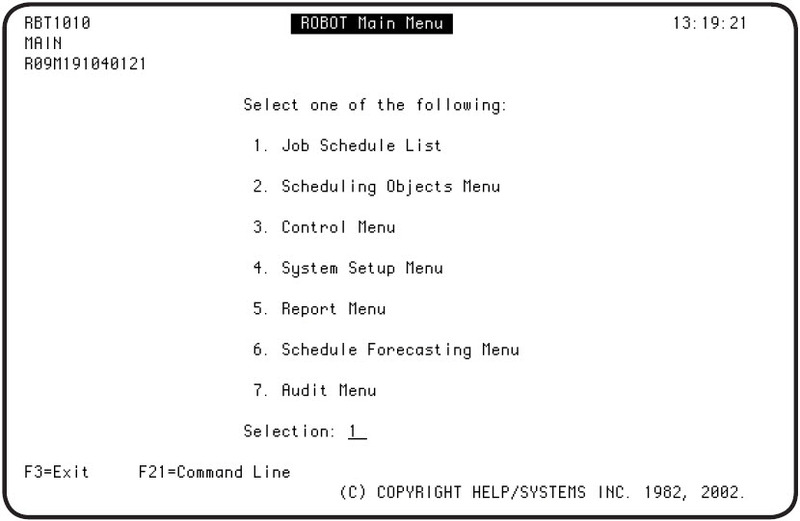 Start Robot Schedule by entering the command RBO on a command line. Select option 1, Robot Schedule. 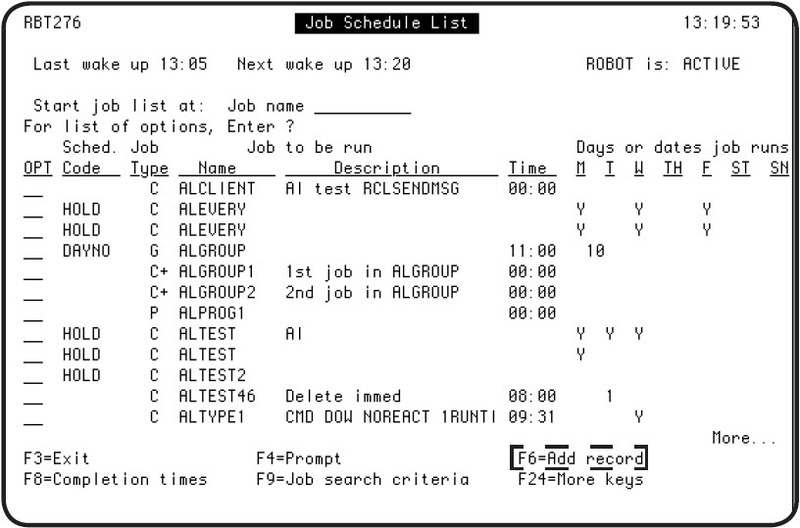 On the ROBOT Main Menu, select option 1 to display the Job Schedule List panel. Press F6 to create a new job record. 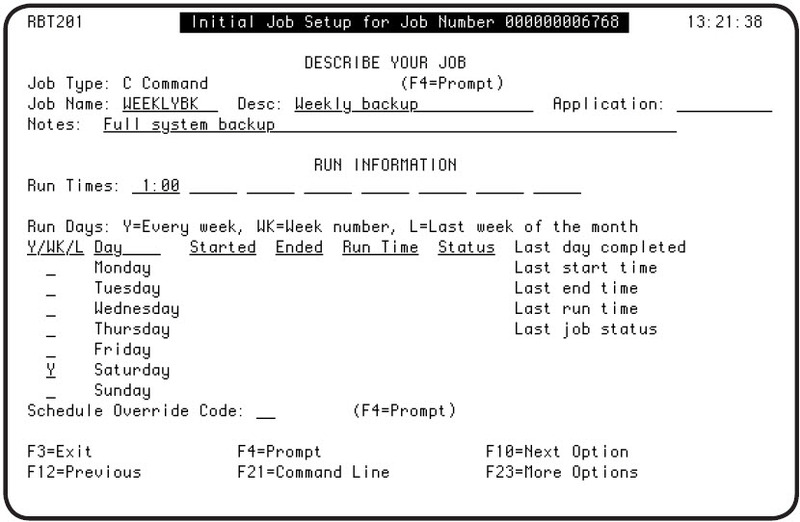 On the Initial Job Setup panel, enter the information for the job. Enter a C (command) in the Job Type field. Specify a name for the job, for example, WEEKLYBK. Enter the date and time you want the job to run, for example, 0100 (1 a.m.) on Saturday morning. Press Enter to save your changes and then press F10 to continue to the Robot Command Entry panel. 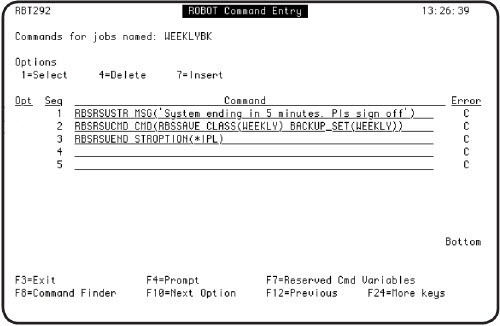 Use the Robot Command Entry panel to enter the RSU commands to be scheduled in Robot Schedule. The following panel shows the RSU command stack. To begin entering the command parameters, make sure that the Robot Save libraries, RBSPGMLIB and RBSDTALIB are in your library list. 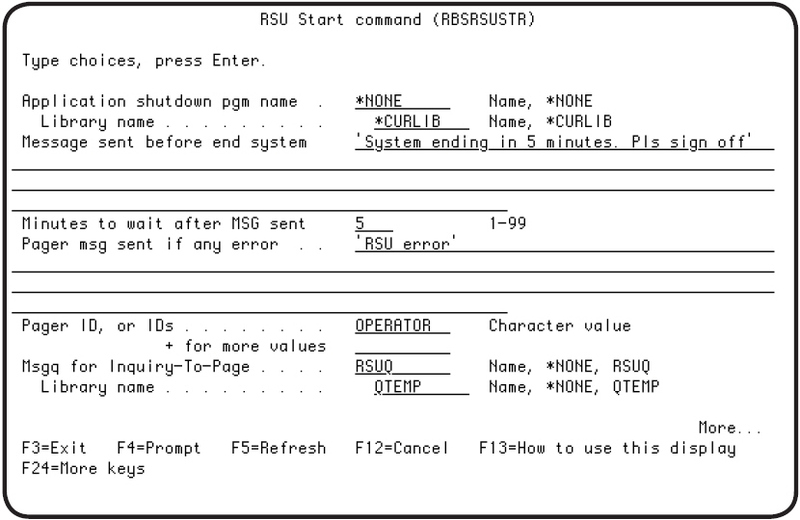 Enter each RSU command and then press F4 to display the command prompt panel. Each of the command panels are described below. For complete information about the Restricted State Utility, see the Robot Save User Guide. Enter the RSU Start Command, RBSRSUSTR. The RBSRSUSTR command places the IBM i in a restricted state by ending the system using the ENDSBS *IMMED command. Note: If the IBM i cannot go into a restricted state within a specified time (the default is 60 minutes), Robot Save automatically IPLs the system. You cannot start any subsystem during this time without performing an IPL. Enter the RBSRSUCMD command. On the RBSRSUCMD panel, enter the RBSSAVE command and press F4 to display the RBSSAVE command prompt panel. Enter the name of the backup class and backup set. You can issue the RBSRSUCMD command multiple times during the same restricted state job. You can enter any IBM i command allowed in a restricted state on a RBSRSUCMD command. The RBSRSUCMD commands run in the order they were entered. For example, you can use the RBSRSUCMD command to execute command such as RCLSTG (Reclaim Storage). We recommend that you perform a RCLSTG quarterly, or at least twice per year. You also can automate the RGZPFM (Reorganize Physical File Member) command using RSU. See the IBM Backup and Recovery Guide for more information on using the RCLSTG or RGZPFM commands. All RBSRSUCMD commands must run after the RBSRSUSTR command and after the RBSRSUEND command. Enter the RBSRSUEND command to end the RSU command stack. The RBSRSUEND command has three predefined parameters that let you specify how to restart the system: *IPL to IPL the system; *STARTSBS to start the controlling subsystem; or *CMD, which allows you to specify a command to use to start the system. In the Prerequisite user job name field, specify the name of the user job prerequisite. This is an imaginary user job that is a prerequisite for a Robot Schedule reactive job that will run immediately after Robot Schedule restarts. 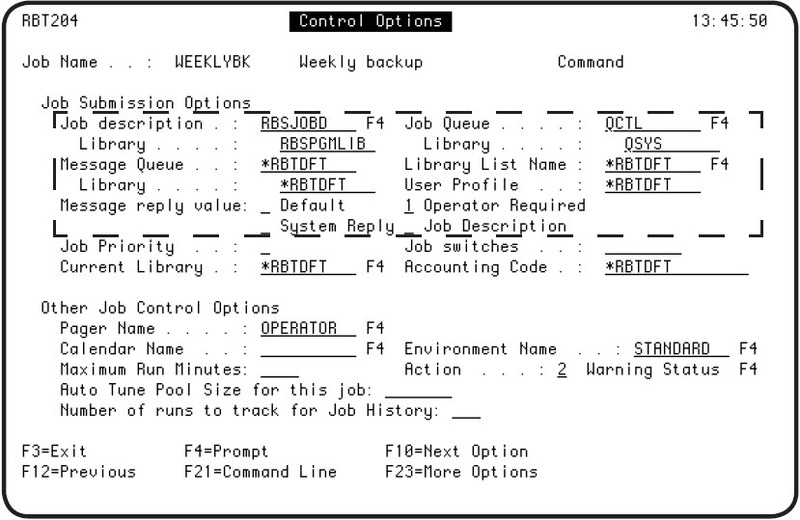 Return to the Job Schedule List and enter option 5 next to the WEEKLYBK job to display the Control Options panel. Specify the Job description as RBSJOBD in library RBSPGMLIB. Enter a job queue for the job, for example, enter QCTL so that the job runs at the time it is scheduled and doesn’t wait for another job to complete. The Message reply value should be Operator Required. When you are ready to run the restricted state job, enter the Robot Save Restricted State Utility command, RBSRSURDY, to prepare the console to enter a restricted state. 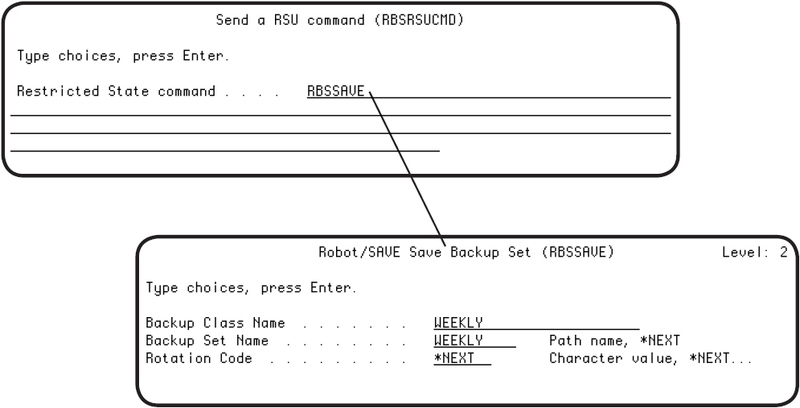 You must enter the RBSRSURDY command at the console from a user profile with the proper authority to perform the backup.